Toledo might be seeing increased traffic coming out of Chicago following their newspaper’s amazing review of the Glass City. Writing for the Chicago Tribune, travel writer Alan Solomon highlighted numerous attractions and restaurants in Toledo during his three-day visit here in August. Like many before, Solomon respectfully describes his surprise at the level of prominence for some sights, particularly the Toledo Museum of Art. He also captures an awareness among many that Toledo’s resurgence is real. 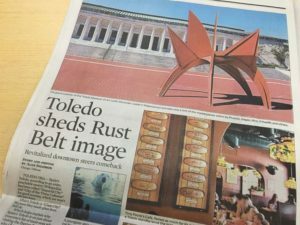 “What’s irresistible is a sense that Toledo not only is shedding its rust and coming back, but – especially downtown – coming back strong,” Solomon wrote. This story happened through the Regional Growth Partnership’s editorial marketing program. Last fall, the RGP traveled to Chicago to meet with various top-tier media outlets to promote downtown Toledo’s revitalization. Accompanying the RGP to help tell that story was Randy Oostra from ProMedica and Joe Napoli of the Toledo Mud Hens/Walleye. Continuing his story, Solomon features other top spots including the Valentine Theatre, Holy Rosary Cathedral and the Botanical Gardens. He also sampled and touched on a handful of restaurants such as Registry Bistro and Georgio’s Café. With each landmark and eatery, Solomon makes a compelling argument for travelers to visit Toledo.